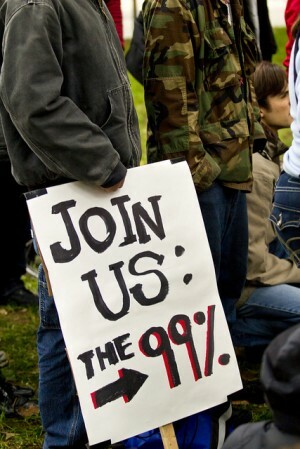 A protest sign during the first day of Occupy DC. 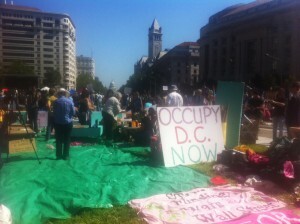 The Occupy Wall Street protests have spread to other cities, including the District. Protesters are are calling for an end to corporate greed and proclaiming the vast majority of Americans suffer while the rich haven’t. It would make sense that such a movement would have particular relevance for communities of color, who are facing higher unemployment rates and are largely on the losing side of the wealth gap. So some have wondered why the crowds in some cities have been mostly white. … The economic crisis did not begin with the collapse of the Lehman Brothers in 2008. Indeed, people of color and poor people have been in a state of crisis since the founding of this country, and for indigenous communities, since before the founding of the nation. We have long known that capitalism serves only the interests of a tiny, mostly white, minority. The vast majority of the crowd at Occupy DC’s Thursday protest was white, but a number of people of color said they felt speakers’ messages and the crowd assembled was representative of those who are suffering. A crowd gathered on Freedom Plaza on Thursday. Most, but not all, protestors were white. Some white activists, however, said the crowd was disproportionately white. Some questioned whether the fear of facing law enforcement could have dissuaded people of color from attending. There have been reports of clashes with police at the New York protests. White activists also said better outreach was needed. Dwight Kirk of the Coalition of Black Trade Unionists said there needed to be greater diversity, but he was optimistic that such gaps could be bridged, particularly with the use of social media. The effort needs to be a conscious one, he added. “There needs to be an awareness that we’re not all coming to the table equally empowered,” he said. The reality is that organizing a protest in the middle of a weekday prevents a lot of people from participating. It particularly shuts out the working poor who, regardless of race, cannot afford to take a day off from work — even if it’s to protest against a system they feel has by-and-large failed them. money I PRINTED UP to get YOU TO DO what I WANTED.